General Comment 10: Freedom of Opinion : now replaced by General Comment 34, issued in 2011.
the relationship between articles 19 and 20. The Committee's views and Australia's responses are available on the Attorney-General's page on human rights communications. Mr Coleman was convicted under Queensland law for giving a public address in a pedestrian mall without a permit. The Committee rejected Australia's arguments that the complaint was inadmissible and unsubstantiated. there was thus a violation of Article 19. In its response Australia rejected the Committee's finding of a violation and argued that the permit system in operation was necessary to protect the rights of other users of the mall. The Special Rapporteur on the promotion and protection of the right to freedom of opinion and expression has produced an exetnsive range of materials. A well established principle of statutory interpretation in Australian courts is that Parliament is presumed not to have intended to limit fundamental rights, unless it indicates this intention in clear terms. This includes freedom of expression. See our page on common law rights and parliamentary scrutiny . The Australian Constitution does not explicitly protect freedom of expression. However, the High Court has held that an implied freedom of political communication exists as an indispensible part of the system of representative and responsible government created by the Constitution. It operates as a freedom from government restraint, rather than a right conferred directly on individuals. In Nationwide News Pty Ltd v Wills (1992) 177 CLR 1 and Australian Capital Television Pty Ltd v the Commonwealth (1992) 177 CLR 106, the majority of the High Court held that an implied freedom of political communication exists as an incident of the system of representative government established by the Constitution. This was reaffirmed in Unions NSW v New South Wales  HCA 58. Once it is recognised that a representative democracy is constitutionally prescribed, the freedom of discussion which is essential to sustain it is as firmly entrenched in the Constitution as the system of government which the Constitution expressly ordains (Justice Brennan at 48- 9). The doctrine presupposes an ability of represented and representatives to communicate information, needs, views, explanations and advice. It also presupposes an ability of the people of the Commonwealth as a whole to communicate, among themselves, information and opinions about matters relevant to the exercise and discharge of governmental functions on their behalf (Justices Deane and Toohey at 72). The efficacy of representative government depends upon the free communication on such matters [in relation to public affairs and political discussion] between all persons, groups and other bodies in the community. That is because individual judgment, whether that of the elector, the representative or the candidate, on so many issues turns upon free public discussion in the media and the views of all interested persons, groups and bodies and on public participation in, and access to, the discussion. In truth, in a representative democracy, public participation in political discussion is a central element on the political process: Chief Justice Mason at 139. There are no limits to the range of matters that may be relevant to debate in the Commonwealth Parliament or to its workings. The consequence is that the implied freedom of communication extends to all matters of public affairs and political discussion, notwithstanding that a particular matter at a given time might appear to have a primary or immediate connection with the affairs of a State, a local authority or a Territory and little or no connection with Commonwealth affairs. To take one example, the Parliament provides funding for the State governments, Territory governments and local governing bodies and enterprises. That continuing inter-relationship makes it inevitable that matters of local concern have the potential to become matters of national concern" Chief Justice Mason at 142. The precise nature of the implied freedom of political communication remained uncertain following these two cases. Chief Justice Mason described the implied freedom as a ‘freedom of communication in relation to public affairs and political discussion’. Justice Brennan referred to the ‘freedom of the Australian people to discuss governments and political matters’. Justices Deane and Toohey considered that ‘the Constitution’s implication of freedom of communication extends to all political matters, including matters relating to other levels of government within the national system’. Justice McHugh offered a narrower interpretation of the implied freedom, which focused closely on the requirements of specific sections of the Constitution. He argued that the ‘people have a constitutional right to convey and receive opinions, arguments and information concerning matter intended or likely to affect voting in an election for the Senate or the House of Representatives’. Although it is true that the requirement of freedom of communication is a consequence of the Constitution’s system of representative and responsible government, it is the requirement and no the right of communication that is to be found in the Constitution. Unlike the First Amendment to the US, which has been interpreted to confer private rights, our Constitution contains no express right of freedom of communication or expression. Within our legal system, communications are free only to the extent that they are left unburdened by laws that comply with the Constitution . To the extent that the requirement of freedom of communication is an implication drawn from ss 7, 24, 64, 128 and related sections of the Constitution, the implication can validly extend only so far as is necessary to give effect to these sections. Although some statements in the earlier cases might be thought to suggest otherwise, when they are properly understood, they should be seen as purporting to give effect only to what is inherent in the text and structure of the Constitution . In APLA Ltd v Legal Services Commissioner (NSW) (2005) 224 CLR 322, Gleeson CJ and Heydon J re-emphasised that the freedom was not a general freedom of communication of the kind protected by the United States Constitution. 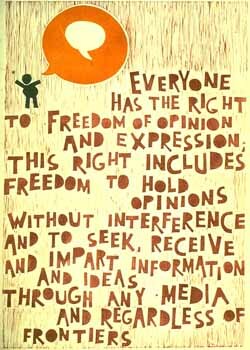 Everyone has the right to freedom of expression. This right includes the freedom to seek, receive and impart information and ideas of all kinds, regardless of borders, whether orally, in writing or in print, by way of art, or in another way chosen by him or her. e. any less restrictive means reasonably available to achieve the purpose the limitation seeks to achieve. Every person has the right to hold an opinion without interference. specify some of the measures needed. The First Amendment to the Constitution of the United States states a right to freedom of speech and press freedom in more absolute terms than Article 19 of the ICCPR or the equivalent provision of the European Convention for the Protection of Human Rights and Fundamental Freedoms. ‘the question in every case is whether the words used are used in such circumstances and are of such a nature as to create a clear and present danger that they will bring about the substantive evils that Congress has a right to prevent’: Schenck v United States 249 US 47 at 52 (1919). This was later refined to the extent that free speech could be restricted without contravening the First Amendment where it is likely to incite or produce imminent lawless action: Brandenburg v Ohio 395 S 444 at 447 (1969). The Supreme Court has held that defamation law is subject to the principles of the First Amendment. Criticism of public officials and public figures will not give rise to liability in an action for defamation in the US, unless ‘actual malice’ can be proved against the defendant: New York Times Co v Sullivan 376 US 254 (1964). However, the First Amendment protection afforded to criticism of public officials and public figures does not extend to defamatory statements made in relation to private individuals. Public figures ‘invite attention and comment’, whereas private individuals ‘have not accepted public office or assumed an influential role in ordering society’ : Gertz v Robert Welch, Inc 418 US 323 at 341–46 (1974).